This isn’t your usual banana bread. 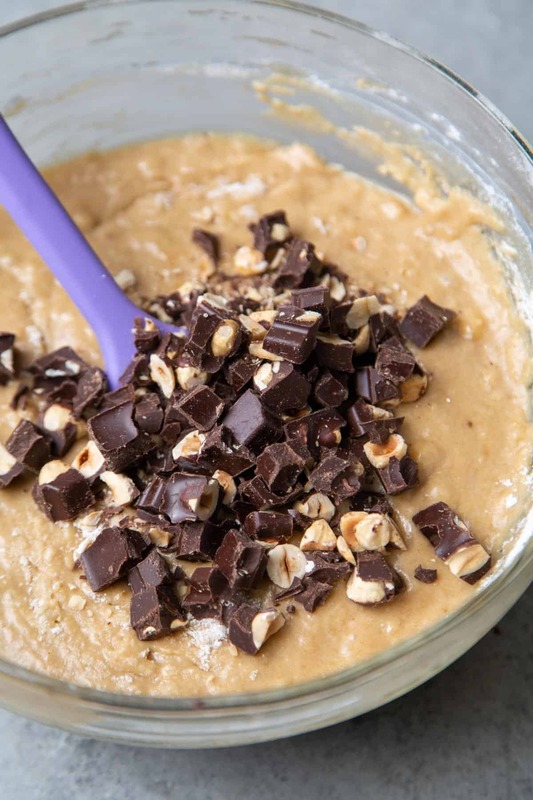 This version includes chocolate and hazelnuts for additional sweetness and crunch! Banana bread is just one of things that’s hard to say no to. And when you mix in a chocolate bar, it doesn’t make it any easier to decline. I love yeast-free quick breads. They are like best friends– always dependable, reliable and there to pick you up whenever you’re feeling down. They mix and bake fast enough to satisfy any sweet craving. Like I’ve mentioned in previous posts, I like contrasting textures in my food. That’s why I love adding toasted nuts to baked goods. My typical banana breads have the usual walnuts or pecans because they are the easiest nuts to add. I love hazelnuts, but they can be such a pain. I can only seem to find hazelnuts with the skins still on them. So when I want to add hazelnuts, I have to blanch the nuts to remove the skins, then toast them, and wait for them to cool before finally chopping them and adding it to the recipe. Not only can removing the skins be time consuming, it can also get pretty messy because the skins get quite static. 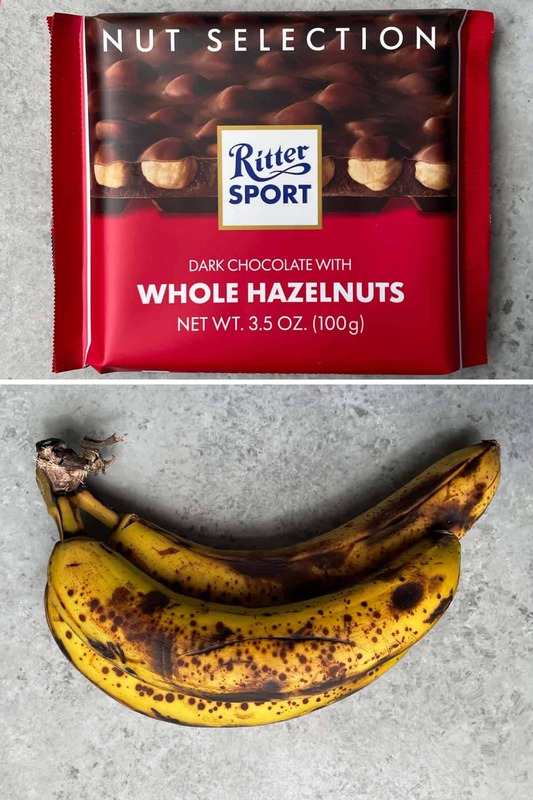 I was rummaging through the pantry and found a bar of Ritter Sport chocolate. Ritter has a large variety of chocolates available and this one happens to be my favorite. Just as I was about to open the package and devour it before my boyfriend returns home– it hit me. There are skinned, toasted hazelnuts trapped inside this delicious chocolate bar. I can use it to bake! And thus, my chocolate hazelnut banana bread was born. Ever since reading Joanne Chang’s Flour cookbook and Christina Tosi’s Momofuku Milk Bar cookbook, I have become obsessed with testing how far I could let my bananas ripen. As you can see from the photo above, I used very ripe and heavily spotted bananas. Even when the skins have turned black, the fruit is still very good for baking. The more ripe the banana, the more sugar and the less starch in the fruit. As this happens the banana gets softer and considerably more sweeter. The sweeter and more flavorful the banana, the better is it for making delicious, irresistible banana bread. Preheat oven 350 degrees F. Grease loaf pan and set aside. Whisk together flour, whole wheat flour, baking soda, baking powder and salt. Set aside. In a small bowl, mix together sour cream, milk and vanilla extract. Set aside. Transfer mixture to prepared loft pan, making sure the surface is even and level. Bake for 50-60 minutes until toothpick inserted in center comes out clean. Rotate pan halfway through baking. If banana bread gets too brown, make a foil tent to cover bread. Let bread cool in pan for 10 minutes before unmolding and cooling to room temperature on rack. Wait until banana bread is at room temperature before slicing with serrated knife. It sure is! The loaf disappeared in record time at my house! 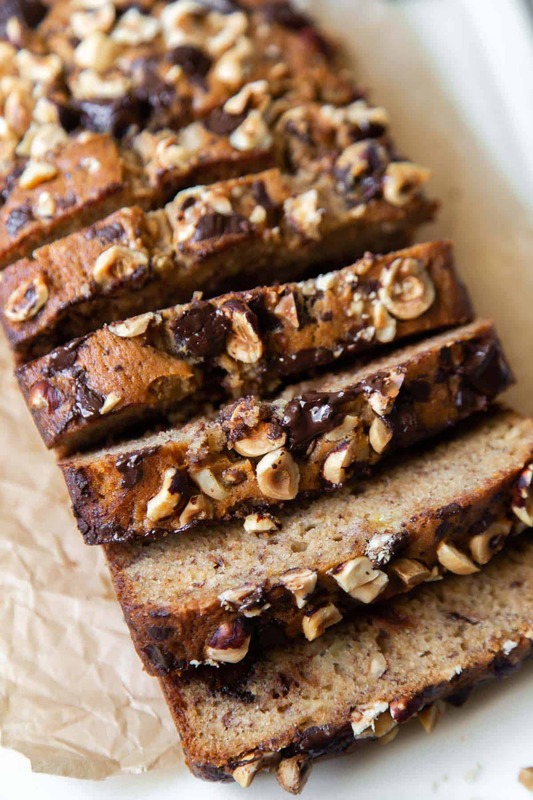 I love that you used a nut filled candy bar in your banana bread- I totally agree with you, i love nuts in my baked goods or something, anything crunchy! This sounds and looks super delicious. I totally agree with banana bread; just made it last week, in fact, using the King Arthur Flour recipe, which you can find here: http://www.winnercelebrationparty.com/home/post/77547/#post. One question: How did adding the Ritter bar affect the flavor of the bread? In other words, how subtle or strong was the hazelnut flavor? And what’s the reason for adding the sour cream (the King Arthur recipe calls for either sour cream or buttermilk or yogurt). The bread tastes like normal banana bread until you get chunks of the chocolate and hazelnut. The hazelnut flavor isn’t very strong. You get hints of it every other bite or so, but it also depends on how coarse or fine you chop the nuts, and how well it is distributed in the batter. The addition of sour cream (or buttermilk/yogurt) adds more fat and moisture to the banana bread– resulting with a bread that is more moist and more dense. Also, the tang of the sour cream is a nice balance with the super sweet ripe bananas. Chocolate hazelnut and banana is a dream! So sorry! I’ve fixed it. The pictures should load on google reader now. Thanks for bringing it to my attention!